This is a poor comparison. The decision with Monahan was whether or not he would develop more in the NHL or CHL, he was clearly not going to develop much in the CHL being so far ahead of the other players in that league. The AHL was not an option. I would argue that if it was, we would have seen Monahan in the AHL for at least part of this season. With Johnny G, the decision has to be whether or not he will develop more in the NHL or AHL, both pro leagues, both above what he is playing at currently in the NCAA. Unless he decides to finish his last year at college, of course. The only two choices were CHL and NHL. You draw the conclusion that if the AHL was available, he might have gone down. I think Mony's play made the choice of demoting him moot by his production and increasing responsibility. The same agument may be made for JH. Remains to be seen. Right, which is why it's a terrible comparison. Why compare a player who can only be sent to the CHL to a player who can be sent to the AHL, it's a completely different situation. Unless you think the CHL and AHL are comparable, which I do not. IF Gaudreau does what Monahan did of course he stays with the big team. However, Monahan had 3 advantages Gaudreau doesn't. Size to withstand hits, coming from a league that allows hitting & being used to a long season. Add to that the speed of the game @ the pro level & Gaudreau will probably be best served by starting in the AHL. Remember Sven has trouble adjusting & he came from a hard to play in WHL. You never know as Matt Read was expected to need @ least a year in the AHL & did fine. Yes I was, They were actual video interviews I had seen, on this site. 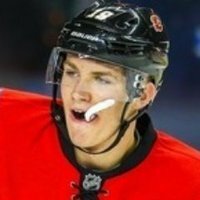 Any prospect who shows potential around here gets over hyped, We've had such poor drafting we're all mostly all starved for a superstar a glimmer of the future. We eat these kids up. Poor Sven fell to that pressure & inflated expectations from not only the fans & media but management too, Burke won't pump a prospects tires, I take him as a blunt realist with realistic expectations. Not a upset de jour type guy...or what ever Feaster said about Sven making the Big club. At the same time Burke tends to call these kids out when they don't meet minimum standards of play. Once Burke sits down with the Gaudreau camp I'm sure both Mom, Dad & Jonny will all feel just as or more confident in Burke as he did with Feaster. Yeah, I have a hard time trying to get an idea of how he will do in pre-season, let alone any cup of coffee he gets on the big club. On one hand, he has improved every year and plays "big" in big games. He is a slippery little sucker, so he may not get plastered the way a Hemske did. He seems fast, so he may be like Byron in outskating players into the seams, or avoiding hits. On the other hand, he will play pre-season against teams' "B" squads to start with, so there are some guys that won't be in the lineup trying to take a piece out of him. I really am just hoping at this point that his "elite" skillset measures up in the NHL at some point. I'm under the assumption that the media out east is taking everything that is said by Johnny's parents WAY out of context. The media is known to grab a snippet statement out of a 4 minute interview and focus all attention on that, and put their own spin on it. I get the feeling they aren't telling the whole story. Look at Duthie's insistent on air misrepresentation of Burke's quote straight to his face near the trade deadline. That was enough to make me vomit. I'm pretty sure the eastern media may be spinning the same crap. That, or the eastern media doesn't like the fact that they are losing a generational talent to a smaller market western Canadian team. The thing I loved about that article was, he said, "never again dad, I won't let that happen." I love the fact he has the will to win and that compete has helped get his team to the Frozen Four. I know it's a team game, but when you're scoring at a near 2pts/game, he's a big reason for it. Boston College in Frozen Four tonight. I hope he finishes on a high note at BC; win the Hobey, win the NCAA with his BRO and linemates (Hayes and Arnold), sign his pro contract, and sign an ATO with the Heat. Would be great for the team to be able to play in the AHL playoffs, if he is allowed. There is no reason for him to continue his development in the NCAA; if he wants to be an NHL player, get out there and prove you can do it. Contrary to what his dad may have said, every player has to prove they are an NHL'er, not just the little guys. Ask Sven. Or Kadri. Or Breen. Go Johnny Go, Go, Go. Let's keep the momentum rolling BC leave it all on the ice, Champions NO Bust!! The Boston College vs. Union game is 1-0 5 minutes in, Gaudreau's got 1 goal and hit the cross bar so far. That shot off the cross bar was nuts. Can't take it anymore, time to go home works dead, Go JG and Boston, keep up the pace! Union up 2-1 in the 2nd period. Come on Johnny, get it back! Union empty net net goal. 5-3 Union. 1:09 left. Ughhhh feel so bad for the guys at BC, what a freakin' nail biter man!! I woulda flipped out if JG scored with 4 seconds left.